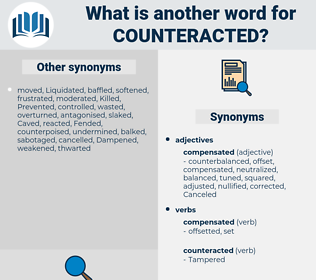 What is another word for Counteracted? 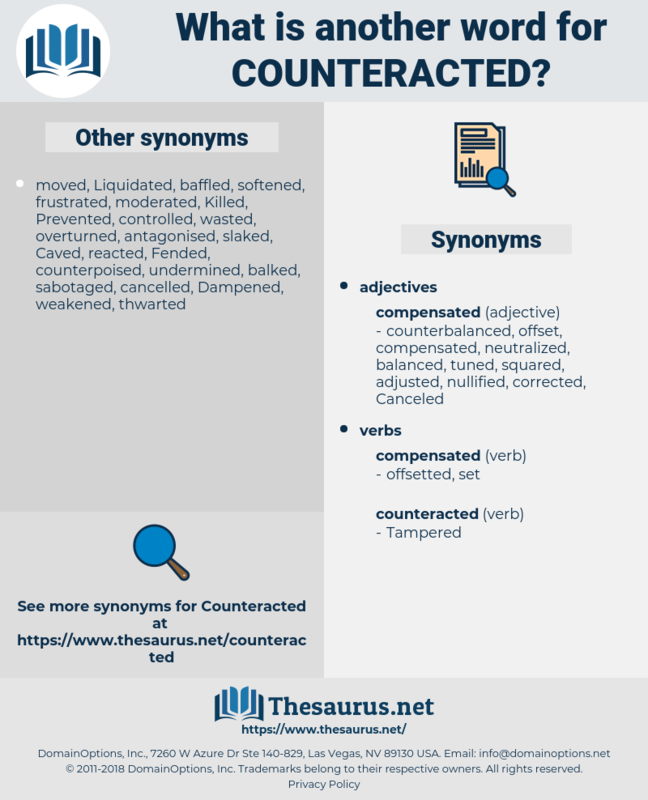 compensated, Contradicted, Confronted, neutralised, mitigated, frustrated, Combated, combatted, Averted, thwarted, Rebutted, removed, Resisted, undermined, Accommodated, destroyed, offset, nullified, balanced, stymied, Hampered, opposed, eroded, reversed, outweighed, disposed, matched, cleared, Approached, tempered. countered, counterbalanced, neutralized, Tackled, addressed, Fought. And yet, by wisely directing the child's use of the first of the Three, much of the ill effects of the trio and their offspring might be counteracted. Not that I'm uneasy about him, but all this talk of his and newspaper advertising had to be counteracted some. contour sheet, contrast, contrasty, counterweight, Chauna Torquata, countershot, contract out, centrarchid, centrist, countryside, centriscidae, centrarchidae, countryseat, condorcet, countersuit, contracted, contract.